This morning we had to meet at the Cham Island Dive Centre at 07h55. Luckily it is just a short walk over the Japanese Bridge and down the road. Travel Planning Tip: I booked our day trip with Cham Island Divers via email while we were still in SA. I enjoyed my hotel breakfast of French toast :) Unfortunately our shower was still acting up and The Trucker didn't even get wet before we were out of water again! There were a lot more divers that I was expecting. And Hoi An seems filled with French people. Literally I have never been surrounded by so many French tourists anywhere before. I wonder if it is because Vietnam was controlled by the French before the war? We had an hour long boat ride to the islands. Not too bad because it is a pretty massive boat (for diving when we're used to rubber ducks). Our first dive was about 65mins (max depth 22m). We luckily only had 5 divers plus the DM in our group. But I don't think the diving here is all that amazing. We saw some fish and I liked the coral garden we ended at, but the colours are pretty dulled. Our second dive, a little while later at another spot around the same island, was also about an hour long. The dives are quite shallow, which is nice.On the second dive, we swam thru this mad section of weird sea plants. White with pink flowers, blowing around like ghosts in the current (our DM called them sea cauliflowers, but after an online search I have no idea what they were actually called). I like that a lot. Then we swam around over more coral, which I quite like exploring. I think The Trucker thought it was a bit boring tho. After the dives our boat took us to the big island for lunch, which was delish. Then we got to swim and relax on the gorgeous beach till 15h30. We watched a giant storm over Hoi An which eventually moved over us. It started to rain but luckily we found one of the big grass umbrellas and beach chairs to sit on after everyone else ran off to escape the rain. It was quite lovely. 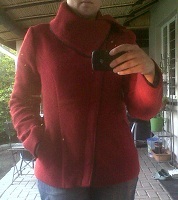 We popped across the road to collect my new jacket. Far too hot to be trying it on here. Hope it is fine back home! (It is, I've already worn it :D) Silk really just sticks to your body in this heat! Then we headed to the shoe shop. My boots were unfortunately too tight. And I don't think they understand that we tuck our jeans into them too back home. But I love the colour! It matches my jacket perfectly :) We will have to check on them again tomorrow now. The Trucker's shoes worked out perfectly tho. 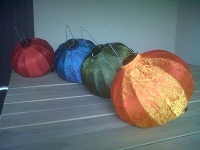 We went to collect my lanterns (stunning!). Unfortunately even tho they traveled fine (which I was a little worried about), it took us a little while to get them open properly now that we're home. For dinner we ended up at the same riverside spot we'd gone for drinks at last night. The Trucker was really in the mood for pizza, which actually seems to be available everywhere. I had some crumbed prawns, which were quite nice. After that we headed back to the hotel and bed, exhausted. Diving will do that to you. Probably this heat too.